At this time of year the test scores of high school students from around the world are released. 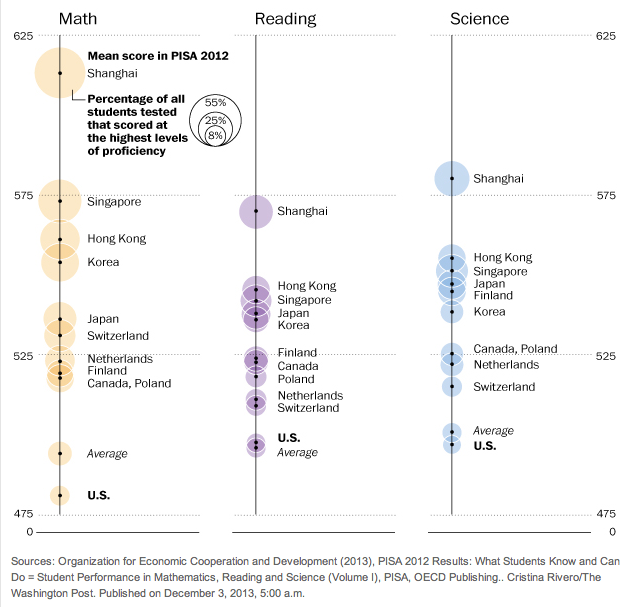 US student performance on the PISA Math, Reading and Science tests are compared to their peers from 55 countries. And every year we hear how our kids scored at the “average” level, seemingly falling further behind a half dozen or more countries. But are these results really indicative of our future success, are we really doomed to losing our “competitive edge” as some critics would argue? Maybe not, according to Peter Sims, in his book Little Bets. Sims argues that educational systems are built upon teaching facts then testing us in order to measure how much we have retained. Students who are taught to solve math problems, for example, focus on learning established methods of logical inference or deduction, both highly procedural. Improving test performance is a matter of becoming more proficient at retaining and applying established practices. The risk, according to Sims, is that students are graded primarily on getting the answers right, and not encouraged to creatively problem solve using their own methods. The consequence is that our right-brain capacities to create and discover get suffocated. Robinson argues that the modern education system was crafted after the industrial revolution to support operational management practices that emphasize efficiencies and productivity objectives. But the emphasis on sequential processes, regimented systems and detailed planning results in the stifling of innovative capacities. 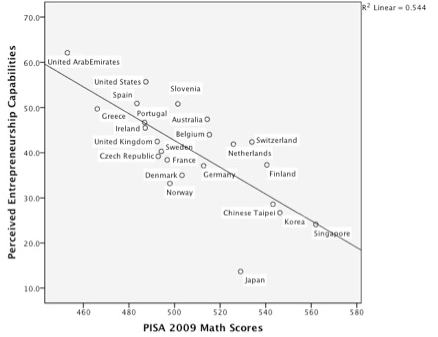 In doing research for his new book World Class Learners: Educating Creative and Entrepreneurial Students Yong Zhao compared the results of the PISA Math scores and the GEM (Global Entrepreneurship Monitor) annual assessment. GEM assesses the entrepreneurial activities, aspirations and attitudes of individuals in over 50 countries, 23 of which participate in the PISA test. Zhao found an interesting and surprising result. There was an inverse correlation between test scores and perceived entrepreneurship capabilities. Top PISA performing countries like Korea, Singapore, Taiwan and Japan, scored the lowest on perceived capabilities or confidence in their ability to start a new business. Research from Dr. Carol Dweck, a professor of social psychology at Stanford University, a leading expert on why people are willing (and able) to learn from setbacks, found that people tend to lean toward one of two general ways of thinking about learning and failure; fixed mind-set and growth mind-set. Fixed mind-set students believe in their abilities and innate set of talents, which creates an urgency to repeatedly prove those abilities, and perceive failure as threatening to their sense of self worth or identity. They are likely to be overly concerned seeking validation, such as grades, test scores and titles. 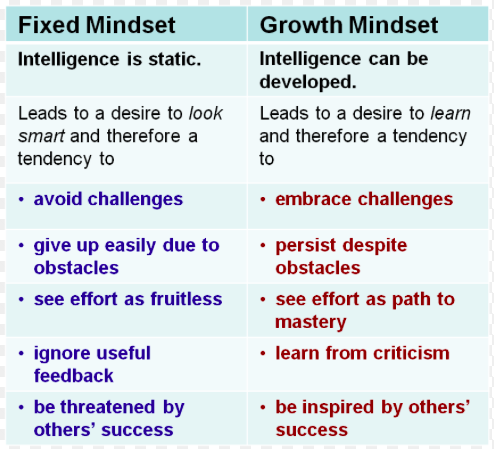 Students identified to be growth-minded believe that intelligence and abilities can be developed through effort, and tend to view failure as an opportunity for growth. They have a desire to be constantly challenged. In her research with elementary school students, Dweck found that mind-set is strongly influenced by what a student thinks is more important: ability or effort. She found that students praised for their effort, “You worked really hard” versus ability “You must be smart”, where more likely to chose the more difficult task and creatively problem solve. Most importantly, when they failed they did not think their performance reflected their intelligence. This insight would help to explain why students who are seen as “failures,” in the tradition sense, like Steve Jobs, are able to succeed and thrive in the face of diversity. It also helps to explain why in the US, students like Bill Gates or Mark Zuckerberg, who drop out of college, which would be shameful or unheard of in other countries, are able to go on to build billion dollar companies and change the world. As the parent of two high school children, I’m not saying that testing student abilities doesn’t have its merits, but I am suggesting it isn’t the only measure of predicting a student’s, or country’s, future success.